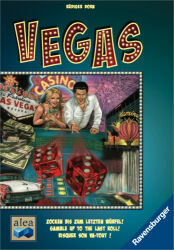 Las Vegas is a push-your-luck dice game designed by Rudiger Dorn and published by Ravensburger. The players are gamblers trying their luck in the casinos of Las Vegas. Over four rounds, players allocate dice to the casinos in the hope that they will be able to win the cash that is on offer at each casino and end up with the most cash at the end of the game. The game can be played by two to five players and a typical game takes about 30 minutes. The game components are made up of 40 dice, eight each in five colours; a set of 54 banknote cards; six large cardboard Casino tiles which act like the board where the action takes place; a start player card and a set of rules. The dice are good quality and the banknote cards are thick and pretty sturdy. The rules are well laid out over four A5 sized pages. The basic game is very easy to learn. Each player receives a set of dice in the colour of their choice, the casino tiles are laid out in a row in the middle of the table and, at the beginning of each round, banknotes are placed next to each casino. The deck of banknotes is shuffled and the top banknote is placed next to the first casino. If the value is less than $50,000, further banknotes are added until the total is at least $50,000. This is repeated for each casino. On a player’s turn, they roll their dice and allocate one or more dice to one of the casinos. The casinos are numbered 1-6 and the player chooses all of the dice showing the same value and place them on the corresponding numbered casino. For example, if they roll three 1s, they place all of these dice on the number 1 casino. They retrieve their remaining dice for the next turn and play passes to the next player. This continues until all players have placed all their dice. Some players may get fewer turns if they roll a high number of dice with identical values, as they all have to be placed at the same time, but you don’t have to choose the value with the highest number of dice. Once all the dice have been placed, each casino is assessed and the banknotes distributed. If more than one player has the same number of dice at a casino, these cancel each other out and are removed. The player with the highest number of dice then receives the highest valued banknote. If there is more than one banknote at a casino, the person with the second-highest number of dice takes the next note and so on. Any notes not distributed to players are returned to the bottom of the deck of banknotes and all the dice are returned to their owners. The same process is followed for rounds two to four and the game then ends. Players add up the value of banknotes they have collected throughout the game and the richest player is declared the winner. Las Vegas is a terrific game and has quickly become one of my favourite dice games. Each turn is filled with agonising decisions and, towards the end of each round, everyone is praying those final few dice rolls, where the active player is often forced to play on the casino matching the number rolled, don't scupper their position by causing a tie. You don't get anything for a tie in this game. Inevitably, something goes wrong for at least one person and there are lots of light-hearted moans at their bad fortune. I've played it both in a family game setting and with gamers and it has gone down very well with both groups. My description above of the basic version ignored the advanced rules for two to four players where, in addition to your coloured dice, you also roll some white dice which have to be placed alongside your dice using the standard rules and, for gamers, this elevates the number of things to think about and gives greater opportunity to mess with your opponents. All in all, Las Vegas hits all the right buttons with me and it was one of my six picks of best games originally released in 2012. And I'm not alone as it was one of the nominees for the German game of the year in 2012. Highly recommended. Note: I was provided with a review copy of the game.